Is there any different in there look? colour, size, marking etc ... ? Hmm.. I don't think many of our members here keep such big fishes (although I am tempted myself). In any case, this newly formed www.tigercraze.com forum might help. It's mostly Singaporeans there. Check it out. Google them, you will get lots of pictures. Origin:Found in south-east Asia in the fresh and brackish waters of the Chao Phraya or Mekong basins. Usually in areas with lots of submerged branches, such as flooded forests. Temperament: Although rather peaceful towards other species, smaller fish may be seen as food. Stocking: Tigerfish are semi-aggressive and territorial to species of their own kind so it is better to keep a single specimen or a group of at least five individuals. They should not be kept with smaller fish that may be seen as food, on the other hand do not keep these fish with overly aggressive species such as large cichlids. Suitable tankmates: Suitable companions include; knifefish, bichirs, arowanas, large cyprinids such as tinfoild barbs and silver sharks, and medium-sized catfish. 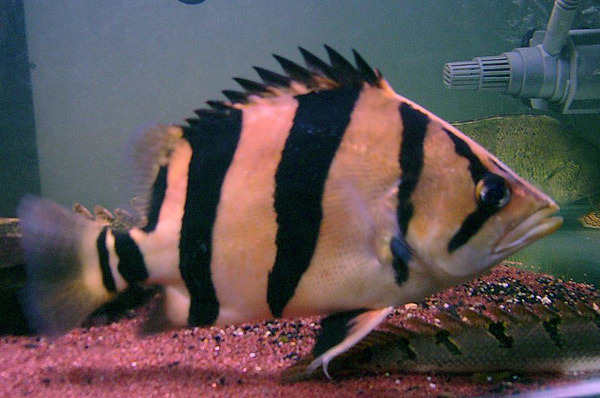 Size: Although slow-growing the Tigerfish will grow to at least 30cm/12" in the aquaria. There are reports however, of this fish reaching 60cm/24" in the wild. Aquarium: For a group of adults a tank size of 180x60x60cm/6'x2'x2' would be the minimum recommended size. For a single specimen a minimum tank size of 120x38x38cm/48"x18"x18" should be adequate. Diet: Tiger fish eat meaty foods such as cockles, mussels, prawns, earthworms or baitfish such as silversides and whitebait. Juveniles will accept frozen/live bloodworm or brineshrimp and may eat carnivore pellets but will not accept dry flake foods. Wild fish at semi-adult size may be reluctant to feed at first and will take a few days to settle in. Live foods such as earthworms and bloodworm which wriggle should encourage these new fish to start feeding. Breeding: Has been bred on rare occasions in the aquaria. Notes: Tigerfish are becoming more and more popular with aquarists due to their striking appearance, dark vertical bands and unusual chracteristics such as their independently moving eyes. These fish are built for predation with large extendible mouths, so do not under-estimate this when choosing tank mates - which may be seen as an easy snack! The ST (Datnioides pulcher) is similar to the Datnioides microlepis mentioned above, with no morphological differences but there are 'diagnosable entities' (primarily based on markings) with separate evolutionary origins. It is also found at the Chao Phraya and Mekong basins. It is the newest described Tigerfish species. AT, Datnioides quadrifasciatus, is also known as the Silver Tigerfish. It is a brackish species and is the smallest of the 5 known species, reaching 12". It is found from India to Indonesia. Origin: Found in estuarine waters around New Guinea and in rivers around the Gulf of Papua. Size: Not known, but around 45cm/18" is probably typical for this species. Water: Lives in both brackish and freshwater. These fish were doing well in hard, alkaline freshwater. The supplier says that it should be possible to keep them in these conditions in the long term, although others do recommend brackish conditions for adult campbelli. Diet: River shrimp, chunks of frozen fish and prawns. Pellets are sometimes taken by other Datnioides species. Aquarium: These fish were sharing their tank with other Datnioides species and were leaving them alone, however, they're not keen on members of their own species. They're predatory, so don't keep them with anything small, and they need plenty of hiding places, as they're quite shy. Given the large adult size, you'll need an aquarium of 150cm/5' or more for a fully grown one. PFK's resident Tiger fish guru, Sean Evans, says that these are best kept on their own in a big tank. Notes: These used to be known as Coius, but Datnioides (note the spelling) is now considered the currently valid name according to the most recent study. My brother keeps them and he frequents AF. However because he is in camp most of the time, im the de facto fishkeeper, along with my planted tanks. did think of keeping them in planted tank once. however, they do jump out of the water (one of them did, once) and i have seriously not seen and "planted tiger" tank. All times are GMT +8. The time now is 15:29.